While Hero has designed quite a few pens based on earlier Parker models, the Wing Sung pens were more of an homage to Sheaffer! 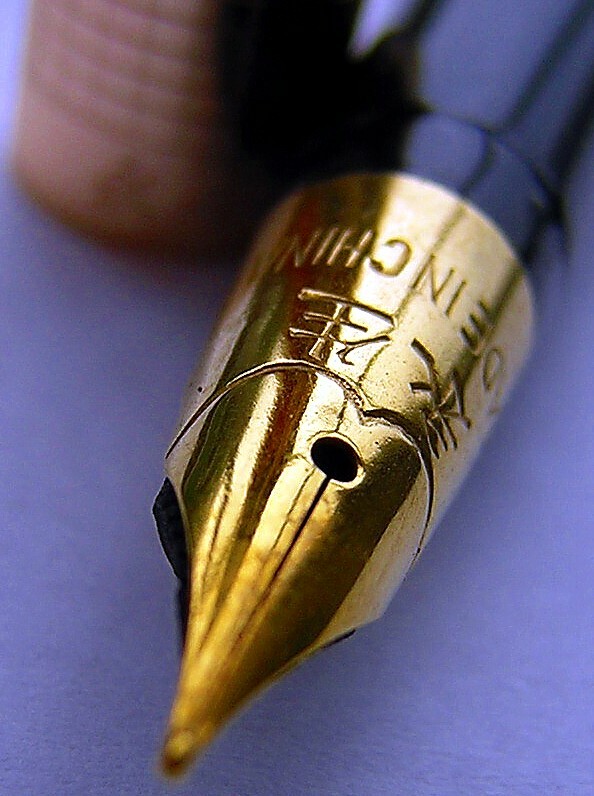 Most notable is the use of a Triumph-style wrap-around nib, such as that on the #233 and #237 model, being a slightly smaller version of Sheaffer's Crest. I was able to purchase the remaining stock of a pen shop outside Shanghai (so quite limited numbers). The Wing Sung pens offered here are NOS (new, old stock) and some are consequently a bit shop-worn (meaning they might need a bit of polishing, but at this price, are a terrific value). "Have received and used both the Dollar and Wing Sung fountain pens. Both write perfectly and better than the remainder of the many fountain pens I use. I'm expect the extra care you take in making sure the nib tips are correctly aligned before shipping the pens makes a significant difference for pens in this price range. Couldn't be more pleased! Thank you for the excellent service." This classy-looking pen is very light weight. I believe it's constructed of a gold-colored aluminum. The textured, grid pattern on the barrel and cap prevent finger marks from easily appearing on the metal surface. Measuring 5-1/8" capped and 5-1/2" posted, it's a mid-sized pen that's comfortable for just about any hand size. The cap band is marked with the Chinese characters for 'Wing Sung', as well as the model number '235'. The spring clip has the name 'Wing Sung' written in English. The nib has 'Made in China' and the Chinese characters for 'Wing Sung' again, as well as the 'heart shape' or 'baby bottom' (depending upon your perspective!) 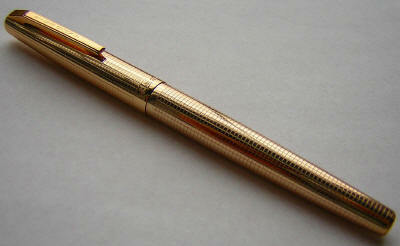 etching, similar to the original Sheaffer Triumph nib. I would describe the nib-size as a western fine. Unscrewing the barrel reveals the pump-style filler, for use with bottled ink.